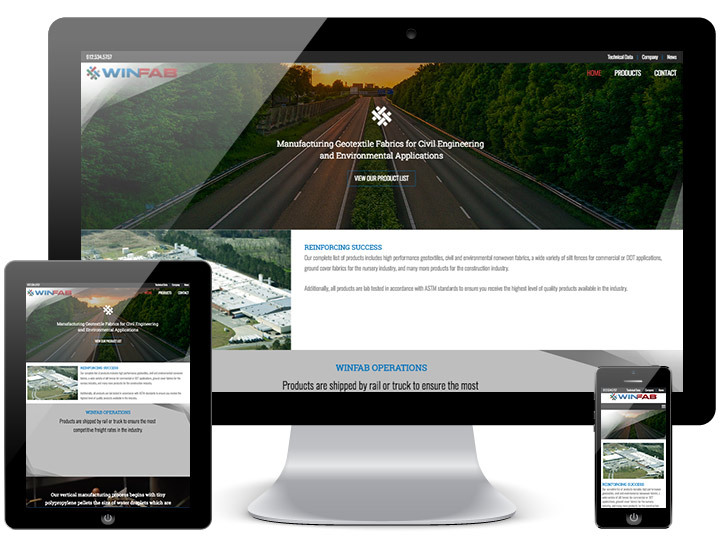 Winfab, located in Nashville, Georgia is a manufacturer of geotextile fabrics for civil engineering & environmental applications. They have a wide line of geosynthetic products that provide engineers with unique options for every design challenge, and also provide service & quality that is unsurpassed in the industry. Winfab has worked with the Charlotte web design team at Animink for well over 5 years. The relationship began due to a need for a website redesign. They were in need of the responsively designed site that could feature all of the datasheets for their products. Once the site was complete, Animink assisted further with additional datasheet creation, business cards, letterhead, envelope design, product brochures, stepped sheet inserts, powerpoint presentations, separate microsite, line cards, equivalency charts, trade show booth designs, LayAR magazine ads, quality control videos, and a host of other collateral material. With Winfab’s extensive growth, the need came once again for a website redesign. Animink created a fresh new site featuring a sleek custom design with a simple-to-use back-end management tools. The website has their product list organized by section and subsection with a clear listing of products within each area. Additional technical datasheets are also available for customers for compliance & installation purposes. The standard company and contact pages are also available, and the entire site is designed responsively by our Charlotte NC Web Design team to function optimally on all devices. Along with Animink’s web hosting services, Winfab is also leveraging a comprehensive digital marketing plan that includes SEO and Pay-per-click. Our digital strategists are implementing a plan to drive more relevant traffic to the Winfab website through on and off-site optimizations, as well as via a targeted PPC campaign. The effects of these efforts have generated further growth for Winfab. Continued website maintenance services also allow us to further refine the site and add new product offerings.